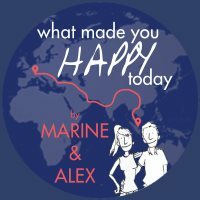 Karimabad – November 27th to December 3rd 2016 – What Made You Happy Today? We left Passu at 7am to carry on our way to the South along the Hunza valley. We took a local bus, which is actually a minivan going along the Karakoram Highway and horning when it crosses villages to tell people it is there. It was a one hour drive in the middle of incredible views. The bus dropped us in Aliabad where we would take another bus to Karimabad which is not on the Karakoram Highway, but a bit aside and higher, surrounded by mountains. The weather was amazingly sunny, like a warm winter day. The next bus was at 10am, so we decided to walk our way to Karimabad and maybe a car would take us along. The road was not paved but the views were stunning. After 50 meters walking, a smiling beautiful man greeted us and after a few presentations he invited us to have tea in his home. 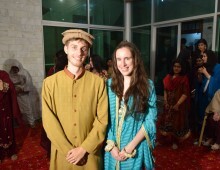 We accepted and he leaded us to a beautiful and simple house overlooking the mountains and the Hunza valley. It was paradise. He made milk tea for us with fresh milk from his cow, and invited us to sit in his home on carpets where we enjoyed the tea, bread, walnuts and fresh apples from his garden. We had a nice talk together and after an hour, we left to carry on our way to Karimabad. After another 50 meters walking, a young girl greeted us from her garden and run to open her gate to ask us to come for tea! We accepted and entered a big newly built house belonging to a man who was principal in the school. He offered us some milk tea and again bread, cakes, almonds, and apples! The girl who welcomed us was his step daughter, she was so funny, I gave her some make up and she insisted to put some nail polish while her step sister designed a beautiful henna on my hand. We had a lot of fun together, while Alex and the father talked about more serious things about France and Pakistan. We finally left, exchanging our email addresses. We carried on our walk on the dusty road overlooking the valley. The trees with autumn colors, the white mountains, it was so beautiful! A car arrived and the driver was happy to bring us to Karimabad. There, we found a room at the Old Hunza Inn, with such a beautiful view on the mountains! Electricity was not guaranteed, and so was not hot water, but whatever! We went for a walk, enjoying the views and the smiles of people. At our hotel, we also met an Australian girl, Barbara, who was living there for a few months. She was the first Western people we saw from a long time. The next day, she invited us to join her for a walk to a viewpoint, Queen Victoria Tower. 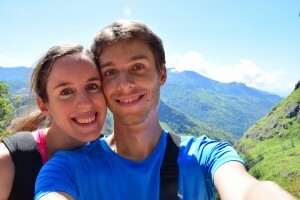 We crossed beautiful villages and hiked the mountain to get an even more amazing view on the surroundings. After that walk, we met again Barbara’s friend, Nazim, and had milk tea in his house. He invited us for a walk around and we ended up on a beautiful terrace, drinking green tea! View from the top, Mt Rakaposhi (7700m) is in front of us! Then Alex and I went to have lunch in a fantastic place: Hunza Food Pavilion. It is a shed, no more than 10m² with 6 seats around a table, and there are two women cooking amazing food from Hunza region which is different food from the rest of Pakistan. On the table, there is a cookbook (not a menu!) and you can choose any dish from it! They are proud to use organic food when cooking and one of them has been to Japan to receive a training in organic agriculture. We had some pasta with spinach (Hoelio Garma), so tasty! So everyday we would go there to have all our lunches for the rest of our stay! We tried also the local pizza, Chap Shuro, a chapatti calzone stuffed with meat and vegetables. Food in Hunza Valley is so healthy, for dinner the cook at our hotel always prepared a mix of lentils with potatoes and sometimes carrots, spinach, tomatoes, and serves us thyme tea. The food is not fried and there is very little oil, contrary to what we were used to with Indian cuisine. At the end of our stay, the women at Hunza Food Pavillion gave me a copy of their cook book, a gift I will keep preciously to try to cook Hunza food when we are back in France! We spent a few days relaxing in Karimabad, eating well, walking, reading, not counting the days. Every morning we would wake up, open our door and sit to enjoy the sun on our doorstep overlooking the valley, eating chapatis and cherry jam for our breakfast, and being greeted by the people passing by, always happily giving us fresh apples and bread. Was it possible that we had found paradise? On a wall in the main street, we could read this quote from Anne Franck “Nobody has ever become poor by giving”. Surely the people from Hunza would give without any second thought (even when we tried to buy a postcard in a shop the seller insisted to give it to us for free!). When time came to leave, we felt very sad and promised ourselves we would go back. I left my book “Three cups of tea” unfinished on my bedtable, knowing I would come back to finish reading it someday, sooner than later. Side note: is it your favorite country up till now? Yes it is our favorite up till now and whatever comes next, we will never forget the great people of Pakistan! One more extremely good reason to go visit Pakistan!! Excellent, si ma mémoire est bonne j’avais logé aussi durant une petite semaine au Old Hunza Inn à Karimabad ! Hunza le paradis, c’est vrai que ça en a tout l’air. Il paraît d’ailleurs qu’un séjour dans la vallée de Hunza aurait notoirement inspiré James Hilton où il parle de Shangri-La dans “Les Horizons Perdus”. 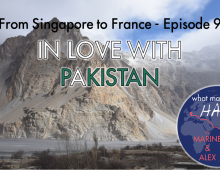 Everyday I open this blog in order to read your next adventure in Pakistan. I am hocked to your writting with such beautifully drafted events in Pakistan. I am from Pakistan and I love my country. I am really glad to know that you’re also being loved by the people of the country. I wish you best of luck for the tour ahead. Looking forward to your writing on Islamabad. Hunza is definitely a special place with wonderful people. Happy to see that the magic is still there. 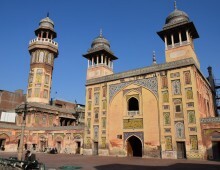 I also would love to visit Pakistan – a few years back an extremely well-travelled lady told me it was her favourite country and I can see why. Will be following your blog for the next instalment!! Thanks a lot Jill 🙂 Yes Pakistan is really worth it! Toutefois il est difficile de trouver des informations, j’aimerai savoir tout d’abord si cela vaut vraiment le coup en dépit de tous les problèmes d’insécurité (je n’aime pas du tout croire les médias et je suis contre). Quelles sont les formalités (visas, passeports) ? Pour une durée assez courte quel serait le meilleur itinéraire sans perdre énormément de temps ? Faut il a la rigueur trouver un chauffeur sur place qui nous accompagne durant toute la durée du séjour ?